Infusion was excited to perform at the Creative Cabaret Cambridge last month! 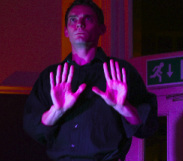 Perched on a high flying stage in the atmospheric Union Society Café, Daniel Cossette performed three different mimes alongside other talented performers. Click for images! The Cabaret is an entertaining evening bringing a variety of delights; each time they host different artists, from comedian poets, to song writer/musicians, to dancers. Set under the high roof and historical reputation of the Union Society building, the intimate venue becomes a sea of enjoyment as the lights, refreshments, and artistry takes the audience away on a journey of–exactly as it says–creativity. It was a fun, inspiring evening, and we highly recommend it! Find them here to get info on the next cabaret you won’t want to miss!